For any investor interested in Africa, there is only one place to be this week: Johannesburg. 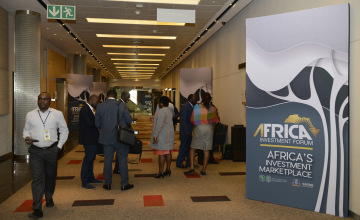 When the three-day Africa Investment Forum opens on November 7, a total of 61 deals with an estimated value of more than $40 billion will be featured in "Boardroom Sessions," while another $28 billion will be showcased to investors at the "Gallery Walk" marketplace. We are delighted that several multilateral financial institutions - including the International Finance Corporation, the World Bank, the Asian Infrastructure Investment Bank, the Islamic Development Bank, the European Investment Bank, the European Bank for Reconstruction and Development, and the Inter-American Development Bank - are cooperating with the AfDB on this effort. Many major financial institutions within Africa - including the Afrexim Bank, the Africa Finance Corporation, the Trade and Development Bank, Africa50, and the Development Bank of Southern Africa - are also involved. For the first time, these major global and regional financial institutions are cooperating to help de-risk investment projects at scale. Of course, pledges of partnership are not the only reason for optimism; economic trends are also strong. For starters, real GDP growth is forecast to be 3.5% this year and 4% in 2019. Today, Africa includes five of the world's ten fastest-growing economies. Africa has also become the world's second-most attractive investment destination. According to the United Nations Conference on Trade and Development, inward foreign direct investment (FDI) is expected to increase by about 20% this year, to $50 billion, from $42 billion in 2017. Finally, Africa's pension funds, insurance funds, and sovereign wealth funds are collectively valued at more than $1 trillion dollars. If Africa could leverage this wealth to attract just 1% of all global assets under management, estimated to total more than $131 trillion, the continent's need for $130-170 billion in annual infrastructure investment could be met. As matters currently stand, Africa faces an annual financing gap of $68-108 billion. As anyone traveling to Johannesburg this week will see, Africa is doing its part to transform the investment landscape. The Africa Investment Forum's goal is simple: provide a smooth runway for investments in Africa. What we need now are investors who are ready to seize the tremendous opportunities in Africa - and at the continent's premier investment marketplace.